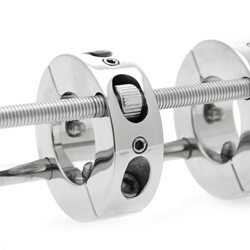 Maintain a pleasant tug on your balls or experience a tortuous extreme stretch with the fully adjustable Hells Bridge Ball Stretcher. 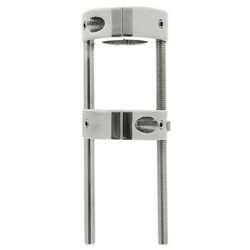 With the two stainless steel rings side by side, place your balls through the openings and lock the rings closed with the included hex key. 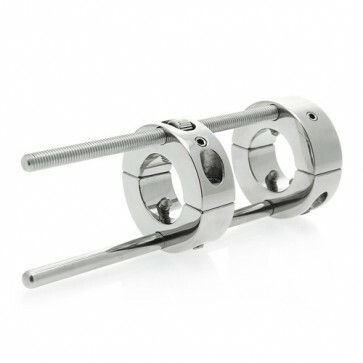 Now that both rings are secure around your sack, you can begin to rotate the nut on the side of the outer ring, causing the rings to draw farther apart. Take the stretch as far as you can stand it. For further torment, use the hex key to tighten down the internal screw points on each ring to introduce additional points of pressure to your stretching scenario. 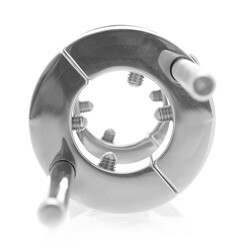 The Hells Bridge also doubles as a ball crusher, when you place only the inner ring around your scrotum and lower the outer ring gradually to achieve a relentless crush. Measurements, Item has 6.38 inch overall length, Rings have 1.32 inch inner diameter, 0.86 inch thickness, 4.88 inch max distance between rings, Adjustable Screw Points protrude up to 0.25 inches into rings.